As a kid, I hated yams. I also hated sweet potatoes. They’re not the same thing. I can say that with confidence as a former grocery store cashier. At “my” Save-on-Foods, the yams were orange and the sweet potatoes were yellow. This is the dish that got even The Electrician, who truly hates yams, to eat them with gusto. He started me calling them “yums” because the new title just made sense to him. When a good friend and her family moved last year, she requested these “yums” as a housewarming gift. This is a multi part how-to that is going to take patience and cost some dish washing time. Today is Good Friday and I’m making them ahead for Sunday’s family Easter dinner. If you want to cook along with me, I’m hoping that will give you enough time to bring the same dish to your family meal. It’s perfectly fine to bake up a big pan of yums to eat in front of your television when no one is watching, too. Remember, this is a vegetable! To start, wash your yams well and gently scrub the skins. Poke them all over with a sharp knife, but try to avoid making deep gashes in the flesh: your goal here is to poke the skin and let the steam out. Line a cookie sheet with two layers of tinfoil, and spray it lightly with cooking spray. The tinfoil is to prevent you from hating yourself later when you’re scouring your best cookie sheet into ruin and debating just giving up and buying a new sheet. Pop your yams on the foil-lined sheet into the oven at 400 degrees. This is a good time to open a window: the syrup dripping out of the yams will burn on the pan (it’s okay, we used tinfoil) and start to smell a little funky. Let’s not talk about the first time I tried doing this, when I used no pan at all and the yams bubbled all over the bottom of my oven. It took six batches of cookies to burn away the burned sugar smell. Ick. 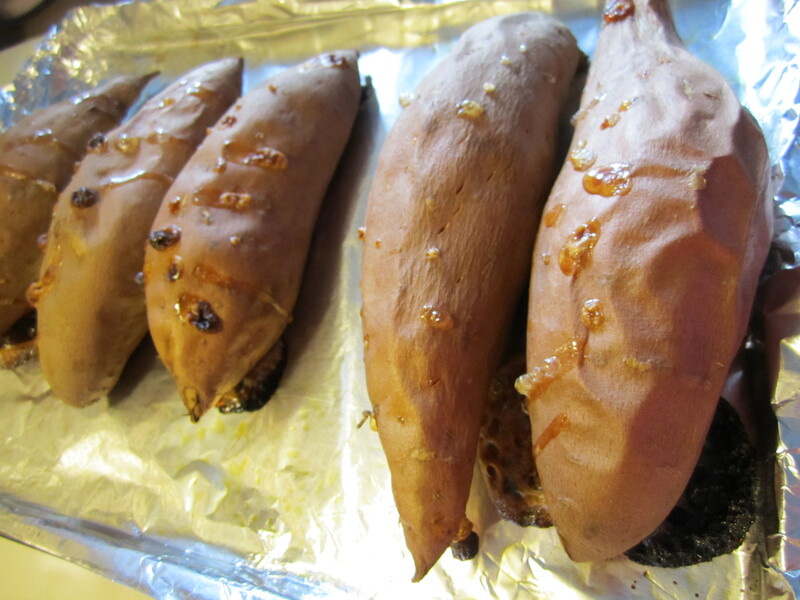 After about half an hour, turn the oven down to 350 and keep roasting your yams until they’re soft and squishy. Mine took a good 90 minutes total today. You’ll smell the sugars from the yams caramelizing as the juices drip out. This is a good thing. We want to roast those suckers so the flavour becomes sweeter and richer. It’s a beautiful thing. See the bubbly sweet stuff coming up? Yum. I roasted enough yams for a double batch. I'm going to show you what to do with only three of these babies. When the yams are mushy and the juices are brown, cut the yams in half across their waists with a sharp knife. Watch out for the steam: I’ve burned myself a few times. If you plan your angles right, you can lean in over the yams and give yourself one of those salon aromatherapy steam facials. You know, loosen your blackheads or your sinuses or something. Once they’re all sliced in half, leave the yams to cool. 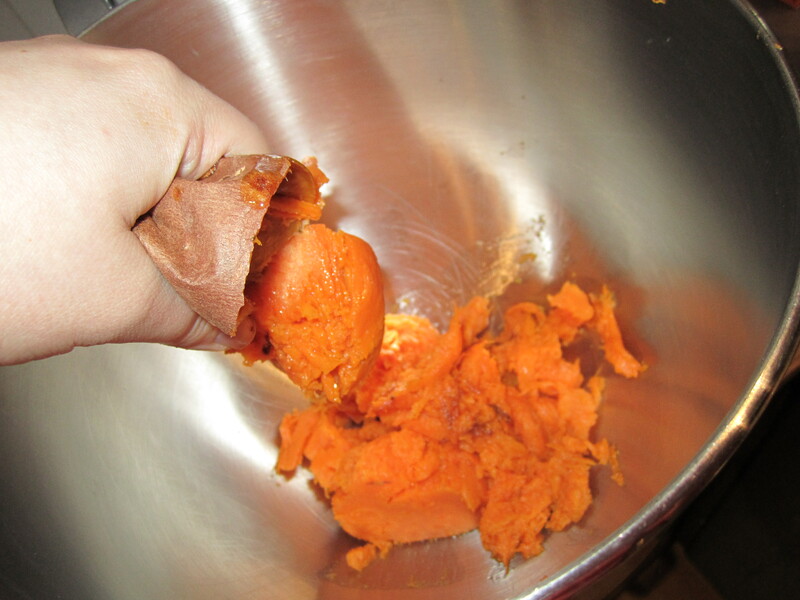 When the yams are lukewarm, hold them over a large mixing bowl (I’ll be using my Kitchenaid mixer). You might have thought I was nutso when we didn’t peel the yams earlier, but trust me on this. Hold the yams cut side down over the bowl, and gently squeeze them so the soft roasted flesh of the yams slips out of the skins and into the bowl. If any skin goes into the bowl with the meat, pull it out immediately. Some of the yam flesh will be browned: this is because we’ve roasted them; you’re seeing happy vegetable sugars. Please don’t panic. They’re delicious. Gently squeeze out all the delightfulness. Whoop the yams at a medium speed until the lumps are gone. Make sure they’re cool (so the egg doesn’t scramble when you add it) and beat the egg into the yams. Next, add the spices. I use pumpkin pie spice, ginger, and cinnamon. I would go with about 4 parts pumpkin pie spice, 1 part cinnamon, and half a part ginger. Then give your pepper grinder half a dozen cranks on a fine setting. Turn on the mixer and beat in the spices, then scrape the bowl down before giving the whole works another whirl. 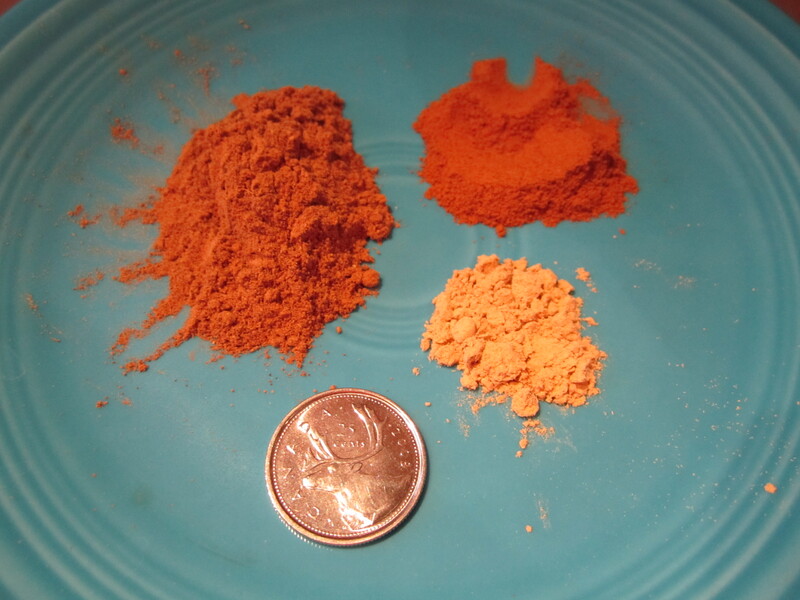 Clockwise from top left: pumpkin pie spice, cinnamon, ginger, cariboo. Toss in two heaping palmfuls of flour and mix at a medium speed until it’s even. You might need to scrape the bowl down. After it’s pretty even, put your mixer on high and let it run for a couple of minutes until the goop is a lighter colour and is starting to look fluffy. Spray a 9×9 cake pan well with cooking spray, then gently spread the yam mixture into the pan with a spatula, leaving them smoothish on top. Melt one finger’s width of butter on low heat in a medium-sized saucepan. When it’s melted, add two fist-sized lumps of dark brown sugar and keep stirring the saucepan until the sugar melts. To speed up the melting, add a splash of water after a few minutes: this will help the sugar to smooth out. 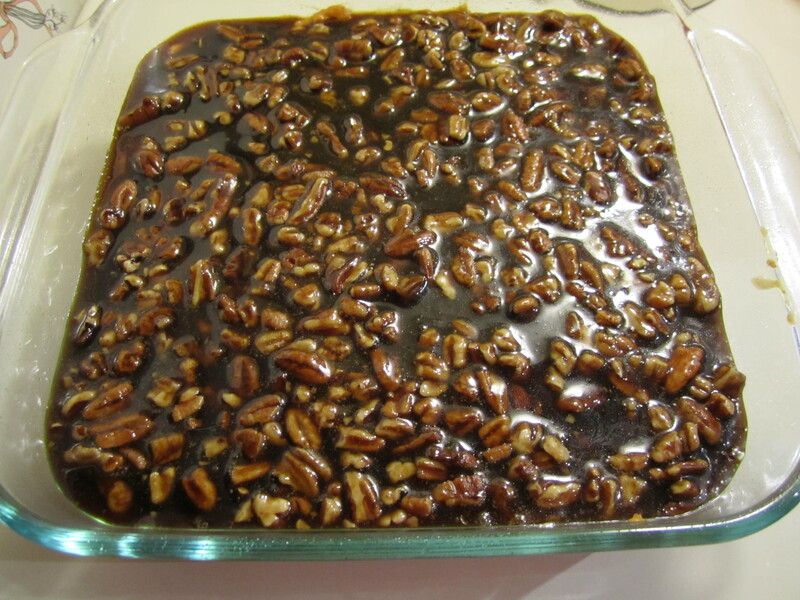 When the mixture resembles a loose syrup, add a couple pinches of salt, a good sprinkle of cinnamon and stir in three big handfuls of pecan pieces. 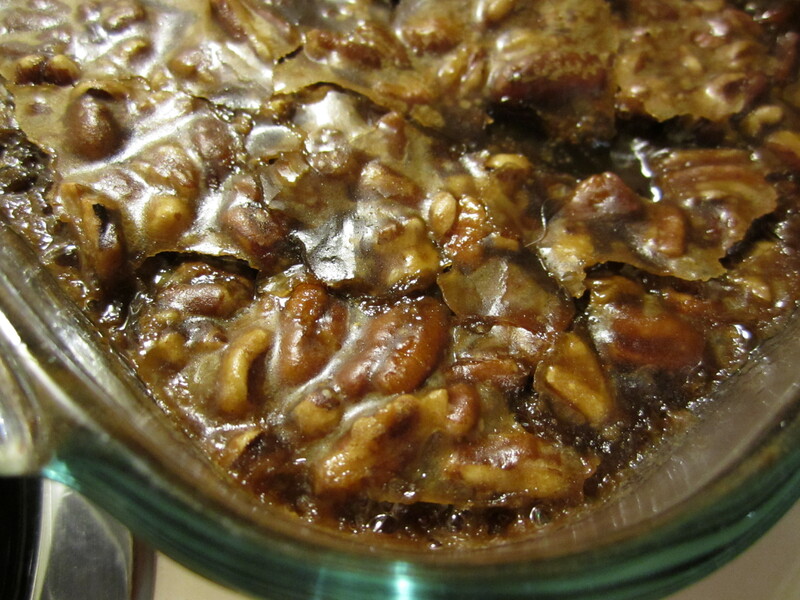 Let the syrup and pecans cool for about fifteen minutes. Gently spread the nuts and sugar mixture across the top of the yams. I’m using pieces of pecans today because, frankly, that’s what was left in my cupboard, but you can use whole ones if you prefer that look. I’ve also made this successfully with slivered almonds. Yums, assembled and ready to bake, or tuck into the fridge. Now you have options: you can pop the whole works in the fridge for up to 48 hours, or you can bake it now. If you choose to bake them later: When you’re ready to eat this orange delight, preheat your oven to 325 degrees and pop them in, uncovered. Watch them closely! They are a scorched disaster waiting to happen. After about 35-45 minutes, they should be gently bubbling. Let them sit out of the heat for about ten minutes to firm up before serving. If you, like me, choose to bake these puppies right now but eat them later, bake them at about 325 degrees for 30-35 minutes, or until they’re bubbling gently and your house smells like pumpkin pie. Let them cool completely, and keep them covered tightly in your fridge. I suggest pulling your pan out of the fridge for about half an hour before you reheat them (at 200 degrees until lightly bubbling) so the glass pan doesn’t get angry with the temperature change and shatter in your oven. Happy Easter, everybody! I hope you get to spend quality time with the people who mean the most to you. Previous Post What the Heck Am I Doing?